My only hope is that enough of the shell can be salvaged so that it can be restored. When first in Paris as a backpacker, I could not believe that I was actually standing by this building. Yes, this is a horrible day for France and for the world. At least some bronze pieces had recently been removed. The entire cathedral is engulfed. Actually, I’d say all or most of the shell can be saved. Those large medieval stone buildings are much more resilient than anything that has been constructed since, including buildings of our day. Look at the firestorms endured by many German city centres during WWII. The cathedrals were usually right in the middle of the conflagrations, and while all the surrounding medieval houses were destroyed the cathedrals were saved. One major tragedy in Notre Dame would be if the rose window were destroyed. The stained glass panes are held together by lead which would melt easily; but the window is at the main entrance side which is away from the end where the fire started, so there’s hope. The church also contains what people believe to be a relic of the crown of thorns and the “true cross” that Jesus was crucified on. Terrible to see them destroyed just before Easter. The fire apparently started up in the wooden lofts, which is where the Hunchback in the story lived. Maybe it was Quasimodo’s ghost. Very interested to find out the cause. Been a series of church fires lately. Investigators have said it was accidental. But they will investigate if anyone was at fault. Most likely it was due to the repair work. Even an angle grinder could spark a fire if care isn’t taken. Terrible to watch the video reports. Hopefully enough saved for a full restoration. This is really sad but at the end of the day, nothing lasts forever and it is just a building, albeit a very old and beautifully built one. A wonderful monument to our Judeo-Christian heritage. I wonder who set the fire? Gilet Juanes perhaps? Dave – I think your comment is lacking perspective not to mention historical, cultural and artistic appreciation. These things happen Mahons, and I never said it wasn’t upsetting. But and at the end of the day nobody lost their lives as far as I know, which is the more important factor. And I’m pretty sure they going to rebuild the parts of the cathedral that were destroyed. Investigators have said it was accidental. The link to the source is missing. Not merely being unaware of these attacks on French churches, it appears that we are supposed to remain unaware……. Ah well. I suppose it was only a matter of time before the hidden hand emerged. Paul – were you aware of the attacks on French churches? I wasn’t, so some kind of accident was highly possible, especially given who the workforce would be. Now, in the light of the campaign of attacks against church buildings, arson becomes a serious possibility. Anyway, if investigators have stated that the fire was an accident – so soon after the fire – then there should be a link to source. The possibility of arson should be considered and it is more probable than an angle grinder. Another ‘fact’ that Allan has pulled from his backside. Even in my limited use of angle grinders, I’ve managed to start to accidental fires using them. The probability of doing so, is greatly increased when you’re working near dry wood in a dusty environment. I have no knowledge of the composition of the construction team here, and I doubt that any others do either. The Newsweek report of significant vandalism and arson against churches must be noted. Reach no conclusions, rule nothing out at this point. Accidental fire at construction sites is an unfortunately common occurrence. Here, where you are dealing with an ancient structure whose insides are made of old wood, with no fire breaks at all, was a perfect site for fire to spread and grow huge. No I wasn’t aware of a series of apparent attacks of vandalism on Catholic Churches is disparate parts of the largest geographical country in western Europe. Why would I be? The difference of course here is that vandalism of churches in rural towns is a completely different beast from a fire at one of Europe’s most iconic buildings, filled to the brim with priceless relics and art, which was undergoing renovation work in one of the world’s major cities. But hey, dots are being joined so why let apples and oranges comparisons get in the way of a good conspiracy? Spot on and highly probable Phantom. Maybe because you might have occasion to read the paper, or a magazine, or the internet, or listen to radio news, or watch TV news. Absolutely correct mate. When I lived down south, many of the houses in the surrounding villages had thatched roofs. I can recall several stories of those roofs catching fire due to some form of renovation, repair or construction work going on in those houses. No Dave – just an opinion. Absolutely – he should in no circumstances be allowed near an angle grinder. And, as we all know, Notre Dame is a steel construction and angle grinders are needed everywhere. 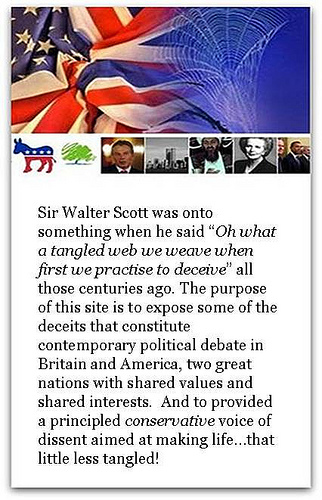 Back to the fire, and it should be noted that many are rather pleased with events…..
For the benefit of Phantom who fears the consequences of opening a link from ‘unapproved’ sites, the image below shows muslims laughing whilst ND burns in the background. The renovation might involve steel, Allan. C’mon I thought that you knew something about something. Hard to imagine a more ridiculously ironic comment. 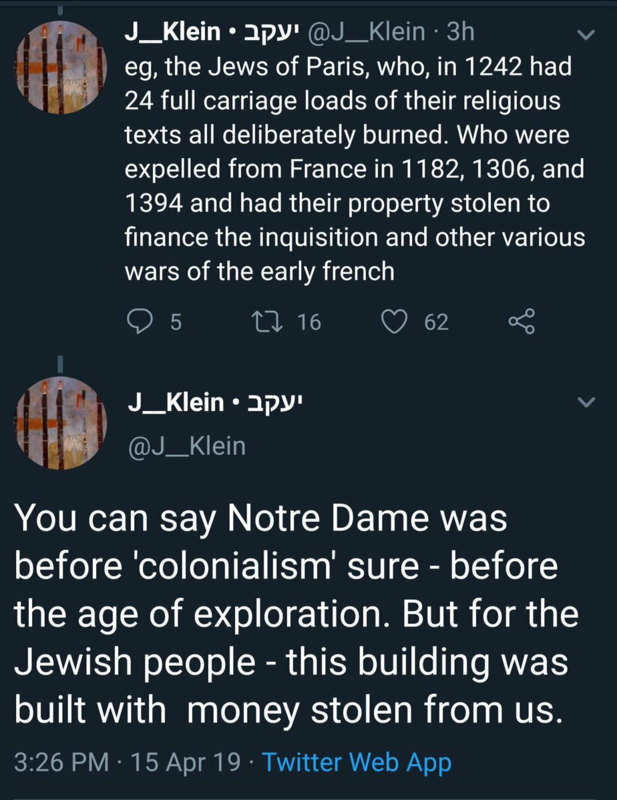 First, Jews in Paris were being persecured on and off throughóut the period of Notre Dame’s construction, and they were finally banished from the city completely the very year the church was first consecrated. (it also isn’t improbable that the two events are related). Jews were subsequently exiled from France for centuries, but gradually began coming back in the 17th C. Finally during the Revolution, in the early 1790s, Jews were fully emancipated in France – the same time as Notre Dame was taken from the church, deconsecrated and given over to worship of Reason! Even in new construction, fires happen. A spark, caused by a blowtorch, a metal cutting saw, a discarded cigarette, can set it off. Very witty Allan. I’ll give you that one. You see Allan, this is why people have ignored your theories on ATW for years. You repeatedly destroy your own credibility. Let me speak from my 3 years experience in carpentry, working many times on large-scale timbers in buildings. Firstly, Angle grinders with various cutting disks, sanding attachments and arbours, are used extensively on wood, especially construction timbers. And whilst grinding metal produces a lot of sparks and a higher fire risk, grinding would also produces incredible amount of heat and a lot of sawdust. Even drilling holes in wood, using modern high speed industrial drills, can result in fires. Perhaps you should researchers a bit more, before making your sarcastic comments. Anyway, if investigators have stated that the fire was an accident – so soon after the fire – then there should be a link to source. No that’s not what they are saying. This is what they are saying. An Investigation involving 50 people has just begun. I do all these Phantom and still don’t see why I should know about a localisedseries of sporadic acts of vandalism in different geographical locations in a different country? No Dave – in locations where I work, risk assessment is carried and fire is a major consideration with measures taken a) to prevent them and b) to extinguish them. I would hope that this had been done at ND. There’s a pattern of these attacks in France. If it hasn’t been widely reported in Spanish/French/European media, then shame on that media. Again, I don’t so much criticize big media for what they report, but more because of whast they choose to ignore. And a tip of the cap for ( American ) Newsweek for reporting on it. Apart from them, I only see reporting from Catholic/Christian publications, websites, and from ” right wing ” publications. As Phantom and Paul have pointed out, at this stage no one really knows what caused this fire. However, I would say the most likely explanation was that it was accidental and related to the extensive construction work that is currently going on at the cathedral. No I don’t think anyone has refused any possibility of arson. That’s just you making stuff up again. What I’ve said, as you can see from my post above, is that an accident is more likely an explanation for this fire, than arson. Minor welding work on a ceiling section of the Duesseldor Airport several years ago caused a fire that burned down the entire airport and killed 17 people. Apparently what happened – and this seems to be quite common – was that the welding caused temperatures behind the false ceiling to rise unnoticed, such that flameless smouldering started and gases were emitted and built up. When expanding pressure finally ruptured the construction and led to a sudden intake of air, there was a massive flashover and fires immediately engulfed the ceiling over a large area of the airport and within a few hours the whole place was in ashes. A cousin of mine, a young farmer in Cavan, was tragically killed in a similar way. He had been cutting open a long empty metal cylinder along its length. Farmers use the cut halves of such cylinders as drinking troughs for cattle etc. Unfortunately, and very foolishly, he forgot to open the valve in the cylinder neck. Residual gases became volatile while he was cutting until finally the cylinder exploded in his face and killed him. “If there is a most vulnerable time for a church, it is when it is under construction because we get people who are using torches or welding or cutting, that are of course sources of ignition, to set the wood roof structure on fire,” Corbett said, noting that the interior of the Paris cathedral was covered in scaffolding when the fire began at about 6:50 p.m. local time Monday, near the start of Holy Week. Great architecture is a national expression, not merely the expression of one man. It is interwoven into the French national identity. It is a touchstone of western civilization. It is a spiritual affirmation by the faithful to the glory of God. And speaking of immigrants and old buildings. This is too much of a coincidence…..
It’s curious that the people who built Stonehenge, the structure we see today, were relative newcomers in Britain when they set to work. Before they arrived, the site with circular wooden and earthwork structures had already been in use for thousands of years. It’s incredible to think that the site had been just as as old for the stone age farmers who built the stone monument as their work is for us today. But it was. It is a spiritual affirmation by the faithful to the glory of God. So the all powerful God of the universe, needs huge structures built to his glory? Surely the time, money and effort would be better spent helping the less fortunate. You know, like Jesus preached. Stonehenge is the least of it. The stones are a part of a much larger sacred landscape which stretches across what’s now Salisbury Plain. For miles around the landscape is packed with ancient features. The oldest known human settlement in these islands is Blick Mead, about a mile from Stonehenge, in a curve of the Avon. The Conservative government again demonstrates its attitude to actually conserving something, because it plans to drive a major highway through the landscape and destroy Blick Mead. Archeology suggests that Blick Mead was settled around 10,000BC and continuously inhabited for thousands of years, when monument, henge and mound construction began. Who says that it’s only one or the other? You can help the less fortunate ( the Christian churches and their members do a lot of that ) and worship God in such buildings. You can. But I’m sure God doesn’t mind his followers worshiping in a much less extravagant building. Doesn’t Jesus say as much, in the new testament? That building in particular was / is a gift to every person lucky enough to set foot in it. I can imagine the awe, the joy that people centuries ago would have felt to enter such a place. Another cathedral whose beauty took my breath away when first seeing it. Tim from sales certainly thinks the YouTube video he watched has the answers…..
Dave – you’ve missed the boat on this one. Where will the Hunchbacks drag the maidens to now for Sanctuary? Indeed. All the peasants who hadn’t died from disease or malnutrition, or ended up freezing to death on the streets must have been well impressed. Indeed. These places were meant to invoke awe, and fear. And also impress upon the poor and downtrodden just how powerful the church is. If they were “meant” to do anything, then their purpose, the purpose of all gothic architecture, is to draw the viewers eye upward, towards heaven/the sky. The architecture points upwards, it’s light and seems to defy gravity. It is, almost literally, uplifting. I had no worries about the fire from the start because the main beauty of it is the facade around and above the entrance and, as I said earlier, medieval masonry is far more resilient than modern buildings. Stand in front of this facade (if there aren’t too many tourists about) and I’m sure you will be inspired as well. I’ve seen the Pyramids, the Taj Mahal, the Colloseum, Ayers Rock …. but few structures impressed me as much as Notre Dame. (mind you, Strasbourg Cathedral, Chartres and Ulm and a few others are in the running too). It’s huge and majestic of course, but these old gothic cathedrals also have something very modest and graceful about them. Yes. The only time I was a Brexiteer (it lasted only a day or two) was when I drove with an Irish friend around Stonehenge and then back to the New Forest in the evening. It’s hard to explain, but there’s something unique about the place, including the villages and people, that everyone must consider worth preserving at any price and that you just hope will never be diluted by anything from the wider world. When it was getting late we passed an old cow grazing in a crooked field, and my mate sighed and said, with absoluely no reason or logic: “Well, it’s no wonder they don’t want Brussels or any of that stuff”. It was strange that he’d been thinking more or less the same as I was all along. Some atheists need to project their disbelief into every discussion. I imagine it is because they quaver in their doubt. Noel -while I hoped the facade would remain I worried about the interior and the artwork within. Apparently some things (the Rose Window) survived so there are some silver linings. The important thing now is for it to be faithfully restored to what it was, and not some 21st century interpretation of what it should be. Yes, some modern architects would cause more damage than fire. But let’s also not forget that what we saw until Monday was also not what it (always) was. Some people seem to think that a cathedral like this is built in the 11th Century and we’re seeing it as those Medievals saw it. In fact such buildings were built over a very long period and subseqently damaged, renovated and changed several time, especially the interior, which seems to be the part most damaged by this fire. It was deconsecrated after the Revolution and the rows of stone statues of Kings from the OT outside were destroyed (because the revolutionaries apparently thought they were old French kings, further evidence that you should never trust revolutionaries). The interior was completely changed several times. The choir is recent, and the famous spire that people watched fall two days ago was built in the mid 19th C, so probably many large buildings in New York are older. The main thing IMO is that the facade didn’t incur any damage and will hopefully continue to delight and inspire people forever. BTW, a related issue is the number of tourists milling around such places. It was almost impossible to get a feeling for the interior with all the sightseers around, of which of course I was just another one. But at least I didn’t stand around in groups cooing in Chinese. Several places in Europe are now restricting the number of visitors a place, even a town, can take in a day. This must go further. I propose a kind of entrance exam. There’s no point letting people into a cathedral like this when they can hardly tell if it’s not part of Eurodisney Paris. I think as faithfully as possible. Obviously things change over the centuries and we largely don’t know or can’t tell what it would have looked like when it was first built. So a restoration to the point it was at on Sunday would be the most ideal. I got that sense to. I can be a little claustrophobic in some places and there were just far too many people in it for me to truly enjoy.